Only those that need the money buy a lottery ticket. If you are already comfortably off, the big win is not so alluring. So it is with stock market trading. Some years ago, I put £500 into a spread-betting account and started my trading career. I lost it all. I think of it as a £500 training course. Here’s what happened. The first thing I did was to build a trading model. Stock market fluctuations follow a random pattern with an upward drift. In my model (see below) stocks went up 51.25% of the time and down 49.75% of the time. I assumed that 20.5% of the time, these movements were greater than 1%. 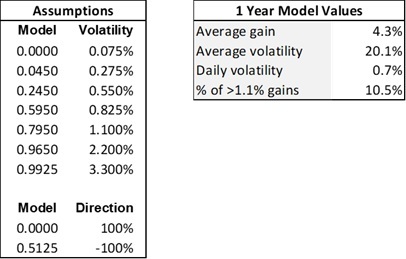 Feeding random numbers into the model and running thousands of simulations, the model yielded results that closely follow the real stock market: on average the market gained 4.3% each year and the average spread between highs and lows in a year was 20%. Armed with this model approximation of the real market, I could now test out different strategies. Let me tell you how valuable all this time and effort was: precisely none. My first trading strategy was a straddle trade in which I placed two bets: one that the market would rise, and the other that the market would fall. Having modelled daily fluctuations, the plan was to try to make money in both directions. Every time I tried, stop-losses cleaned me out. My next strategy was to look for what I called ‘heartbeat’ patterns. As the market tends to over-react, a sudden movement either up of down is often followed by a more gentle return to a position half-way between the recent high or low. The price action roughly follows that of a heartbeat. Every time I placed a bet, I called it wrong. I began to think a more successful strategy would be to carefully consider what bet to place and then make the exact opposite bet. If that sounds laughable, it’s no sillier than other so-called trading strategies such as the Martingale system. If the market is up one day, bet on it being down the next. If you are wrong, double your money. Keep doing this until you are right. I tried this strategy at age 18 in a casino. I patiently built up a nice pile of chips over the course of an evening and then was wiped out by a run of six reds in a row. After these strategies failed, I switched to fundamental analysis. Based on my assessment of the ‘fair’ price for oil or gold or the GBP:USD currency pair I began placing bets on the future direction of these items. I was either wrong or where I was right it didn’t matter because I got wiped out in the meantime by stop-losses. My £500 briefly went up to £650, but then steadily drained down to £42. At that point I stopped trading but I didn’t stop losing money. The trading platform I was on, IG, invoked some inactivity clause on my account and drained down the rest of my money until it hit zero, at which point they closed the account. 1) Everybody loses money trading the stock market. 2) To stay in the game, a few big wins have to compensate for the much more frequent losses. 4) There is no such thing as a system, not for amateurs, and I suspect not even for many of the sophisticated risk management systems of the professionals. Stock market trading is for the needy, like other forms of gambling. My advice is don’t be a loser. But if you decide to try it, don’t say you weren’t warned.